She spent her childhood in California and New York studying classical dance with the renowned Los Angeles Ballet, San Francisco Ballet and American Ballet Theatre until an injury drove her love of drag and pageantry north east and underground. Coming of age amidst the gutter glam and jewel-toned ink of New York and L.A.’s early 80’s street punk scene the ballerina scraped by as a sometimes fetish model, makeup artist, clothing designer and stylist. 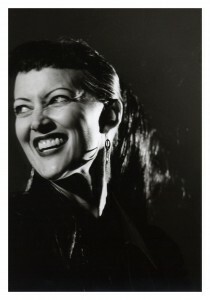 In 1993 Bernadette declared Albuquerque home and in 2001 made her musical debut with one of the hottest roots-rockabilly bands in the Southwest, the Long Goners. Working closely with singer-songwriter Pat Bova, she belted out rebellious anthems in the style of Janis Martin and Wanda Jackson. Together, they shared the stage with rockabilly’s most iconic acts to include Hank Williams III, Jonathan Richman, Big Sandy and many more. 2003 found the burgeoning chanteuse ready to wrap her voice around the more complex musical terrain of jazz. She collaborated with acclaimed bassist and composer David Parlato while forming the new band – Bernadette Seacrest and her Yes Men. The combo’s first album “No More Music by the Suckers” was released in 2004 and features desire drenched jazz standards as well as original songs by Michael Grimes and Pat Bova. The band toured extensively upon the album’s release, playing to packed audiences across the U.S. and France. They were featured on NPR and Swing City Magazine described the album as “…an attempt for a one time rockabilly kitten to break into the modern day jazz scene and break the mold, an endeavor she unconsciously accomplishes.” Their second album, “Live in Santa Fe” was released in 2005 and magically captures the smoke-filled room acoustics of a sold out live performance. In 2006 Bernadette followed her heart to Atlanta where a new project arose – Bernadette Seacrest and her Provocateurs – with guitarist/songwriter par excellence, Charles Williams and journeyman bassist Kris Dale. In 2009 “The Filthy South Sessions” was released to critical acclaim. The album’s collection of songs range from the All Mighty’s drinking habits to an epic lament about a diner at the end of the world, with stops in between. The arrangements are an amalgam of jazz, rockabilly and swing noire elements that elude all descriptors, allowing each musician’s considerable talent to shine through. During this era, Bernadette was awarded Best Atlanta Vocalist twice by Atlanta’s leading alternative press publication “Creative Loafing”. With new album in hand, Bernadette and her boys went on to tour exclusively in France. In 2012 The Provocateurs disbanded and Bernadette went solo. With bass player extraordinaire Kris Dale as musical director, they crafted a different approach to their next album released in 2016 under the title “Lust & Madness” – an unconventional and bracing body of work – inviting repeated visits to the dark wells of the soul. Like an all-consuming novel, we consider life’s twists, plights and circumstances…with Bernadette’s seductive voice guiding us all the while atop raw and sparse instrumentation. Bernadette’s allure continues to foster a constellation of talented friends as Atlanta’s local heavy hitters Big Mike Geier (AKA Puddles Pity Party) and legendary Hall of Fame inductee Francine Reed appear on two separate tracks. A Bernadette Seacrest “show” is better described as a coveted experience for the quietly informed. Her willing subjects recoil, laugh and blush as she relentlessly exorcises the demons of doubt, inhibition and lowered expectations born of life’s bludgeoning routines. Fans smile knowingly while newcomers are buffeted through songs with each new effort seeming to top the last. When the lights come up, they carry their experiences home in a beguiled state of wonder. Something has been restored and reclaimed. It’s authentic…. it’s intimate….. and we are blessedly reminded of how music can make us feel when we’re lucky enough to be in the right place at the right time. Hi. I just stumbled upon your website following links from The Hot Club of Cowtown. I love what you’re doing. Please come to Ontario, Canada really soon. I’m writing to know when will you came to Portugal for a concert. Congratulations, by the way, for all your work you’ve done. just wanted to say hello, and best wishes, and nice to se your face! Bernadette – I just discovered your music at download.com and I love it. Best of all, I live in ABQ. I look forward to hearing your next hometown performance. Your schedule says you won’t be playing here until July. Is there anything planned here prior to that? Woah woman! We walked into the Martini Grill in ABQ waiting for the happy wave and amazing voice–and damn–you’ve gone! Shows what happens when you have children–but you could have called 🙂 M’be I’ll have to travel to Bordeaux…. Love you, love your voice, and love your website! P/. I love its voice, its music! you she is very beautiful! att: I am of Brazil. je suis tombÃ© par le plus grand des hasards sur ton dernier album! j’ai pu Ã©couter quelques chansons et je l’ai achetÃ©. Greetings from Skopje, Macedonia! You don’t get much mail from here, do you? I have a weekly jazz radio programme Jazz Spaces on National FM Rdaio and would be interested to check posibbilities of presenting soem of your recent music material to jazz lovers in this part of Europe. In case interested, drop me a line. Is there any chance of seeing you in England? Your voice is like honey cutting mustard. The best I have heard, you have a new fan. I’m a admirer from your voice, bernadette. Adored your first cd and the last one two. I don’t know who’s your public here. But someday, if you come to Brazil, please, let me know about it! Every single news you could tell me about new records or shows near from here [in Brazil], don’t forget to remind me, ’cause it will be a great pleasure listen to you, live. COME TO GUELPH ONTARIO. FIND A CLUB, AND IT’LL BE BOOKED WITH YOUR VOICE. I KNOW I’LL BE THERE. JIMMY JAZZ ON CARDEN. LOOK IT UP AND PUT UP POSTERS. Your mother in ABQ misses you. I heard you are giving a concert in Paris on 17 October 2007. Is that correect ? If so, where exactly ? i just pass by here to know more about you…it’s reallly few time i’ve discoverd your fantastic music and your delicious voice. I don’t want to sound trite but your voice is smooth as a deliciously spiked latte. Please come to Toronto so I experience you live. Or maybe I need to hop on a flight to Sante Fe and see you perform at the Swig Club. I’m a fan and a jazz songwriter. I write standards…okay they may not be standards yet, but that’s only a matter of time. I’m in search of the proper channel to submit a couple of songs to Bernadette that I feel would be perfect for her style/voice. So, any concert or touring soon (november or december 07)? In Paris, maybe? Where could we find the dates? I’m not even sure how I ended up on this site. LOL! Coming to Miami anytime soon? Hello, Bernadette, I’d been here before, and now I came back to know about your cds, here in Brazil is such hard find them, so I would like an information if I can get them by mail, you know, a bank account information to send the money and then recieve the cds? If you have another possibilities or information how I can find a cd of yours here, I’ll be glad. When are you planning on playing in Vancouver next??? Hope I can find some of your videos on youtube? Bernadette (Laura) I heard your first DVD at your Aunt’s house in Porland. It was terrific. From your St. Paul second cousin (your Mom’s first cousin). By the way one of my names is Bernadette. If you come here you have a place to stay!